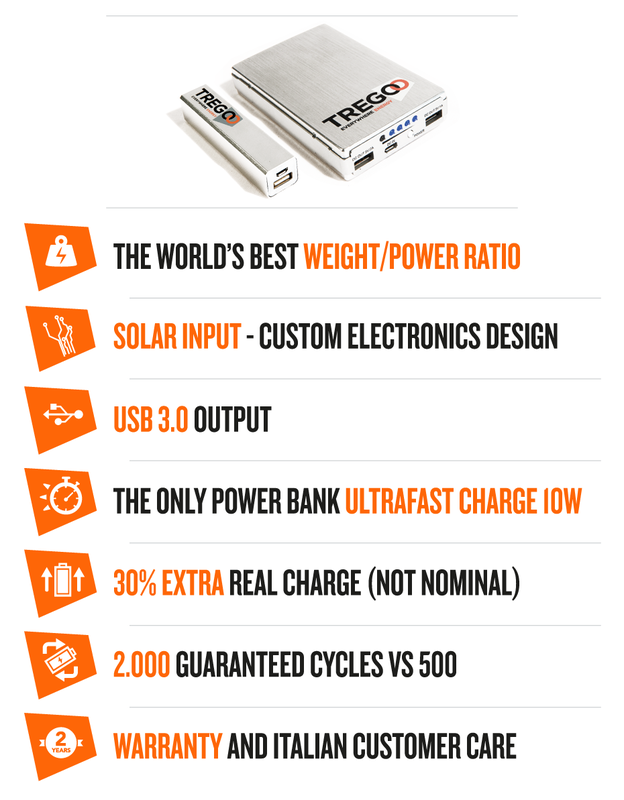 TREGOO IS A PIONEER IN PORTABLE POWER GENERATION. THANKS TO A CONSTANT R&D, TREGOO PRODUCTS HAVE SPECIFICATIONS AT THE TOP OF THE INDUSTRY. Tregoo panels are oversized to provide maximum performance. 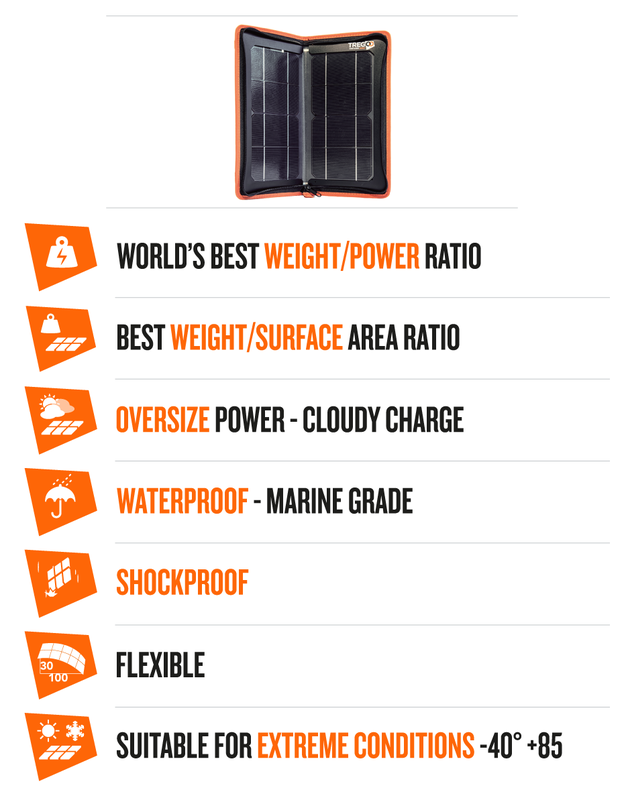 Hippy 10 with 10W and high portability is the most powerful folding panel in the market. Tregoo Photovoltaic Panels technology allows you to keep active the devices charging even when the sky is cloudy. All Tregoo Photovoltaic Panels line is waterproof and sea water resistant (excluding Junction Box where there are the USB ports). The "Waterproof" property makes them an ideal partner for outdoor activity or water sports. Tregoo Solar Power Stations are provided of Power Packs with Lithium Ion Batteries. Up to 70% lighter and smaller than traditional lead-acid batteries, moreover lithium-ion batteries provide a number of charge cycles three times higher. Tregoo Photovoltaic Kits offers Power Packs, with integrated inverter, equipped with Schuko sockets, 2P sockets and American plug, with alternating current output to 110 or 220 Volts. Thanks to direct charge technology some Tregoo Solar Panels offer the possibility to charge the batteries of your devices without the mediation of Power Pack. Direct and simple, as sun energy. Tregoo Solar Panels structure, composed by flexible and ultra light mono-crystalline modules, guarantees a very reduced panel thickness (1.7 mm), allow an easier transport and even the application on curved surfaces. Tregoo Photovoltaic Kits are equipped with one or more USB ports to ensure an easy and powerful energy charge to all your devices. GPS, Tablet and Smartphone always completely charged with Tregoo Power. Compatibility between Tregoo Panels and Power Packs, thanks to its standard outputs (USB 5 Volt, 12 Volt, 110 Volt and 220 Volt), provides Solar Kits ready to use. It’s possible to charge every device in a simple and direct way. With Tregoo technology, electronic devices equipped with battery can take advantage of fast charging, thanks to the efficiency of Panels and Power Packs.